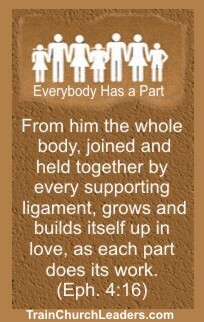 God designed the Church so all its members have a part. We’ve already noted how people with the spiritual gifts of discernment, knowledge, and/or wisdom can find a part in determining what polices are needed. We’ve considered how people with the gifts of exhortation, knowledge, teaching, helps, and/or service could all have a part in the writing of the policies. Now we want to turn our attention to who will have a part in their implementation. People with the gift of administration have God’s power to take something already developed and plan, organize, and supervise others for its effective implementation. Not all people in positions of leadership have the spiritual gift of administration. It is important that leaders with the spiritual gifts of leadership and/or pastor, but not administration, seek the assistance of people so gifted to help ensure that they are pulling on God’s power even in the implementation of church policies. This entry was posted in Policy Making . Next → Next post: Record Keeping & God’s power?